We have a challenge for you. Look at your coffee table. What’s laid on top? What’s on the lower shelf? What are you hiding in the drawers? Stuff. And lots of it. Part of the reason why there’s random pens, paper, nail polish, remotes, books, papers, envelopes and more papers stashed away in your coffee table is because the coffee table’s storage doesn’t really have a particular purpose. The living room is a place where you watch TV, spend time with family and friends, relax when the house is empty and so on. And with that wide string of things to do at home, the living room is a place for living. And so things we use for these activities that end up on and inside the coffee table. But that’s all changed – with the Sobro coffee table. It’s a coffee table with purpose. Your besties are over for gossip and cocktails. As you’re in the middle of hearing about a pal’s recent Tinder drama, you notice the veggie platter is picked over and a few of the wine glasses have run dry. Do you interrupt the dating saga to get more food and drinks? Not if you have to Sobro. The fridge drawer can hold up to 32 cans of pop (or canned wine, if that’s more your thing). It can also keep snacks cold, too. (Speaking of snacks, check this recipe out!) And if house get-togethers or parties aren’t your thing, you’ll love this cold drawer the next time you’re binge-watching Netflix. In addition to two power outlets, this smart coffee table also features two USB charging ports. No more having to get up to check your phone. With the Sobro coffee table, you can charge your phone within reaching distance of your couch or chair. 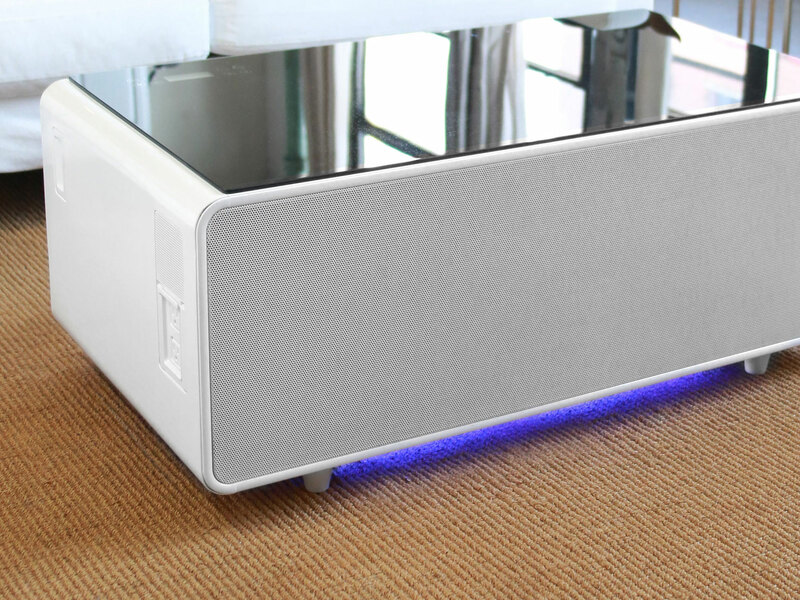 This smart coffee table features a Bluetooth speaker. You’ll feel more immersed with what’s on your TV because of the earshot range – the speaker is right in front of you. You can also use with your phone to play music, much like wireless speakers -– all without taking up table space! As technology gets more advanced, user experience thankfully has gotten simpler. And this smart coffee table is the same. The touch control panel is your centre to control speaker volume, fridge temperature controls, clock, lights (yes, it has ambient lighting underneath) and more. The contemporary style works seamlessly with most decor styles, from mid-century modern to out-right modern. The Sobro smart coffee table comes in three colours: white, black and wood finish. The tempered glass top is scratch resistant and no coasters are required. Plus, it has two drawers to stash those things you have no idea where else to put them – yes, this smart coffee table even does that. What’s Your Christmas Decor Theme? Minimalist Holiday Decor : How Comfy and Cozy are We!